After the merger of Vitera Healthcare Solutions, Greenway, and SuccessEHS, there were three very different software suites. It was clear that the company would need to unite around a next generation EHR. Since PrimeMobile needed to be completely redesigned architecturally, this offered the chance to begin the process of turning PrimeMobile into the future EHR. The UX team split into groups to come up with different concepts. The Senior Interaction Designer and I created a concept that dealt around a customizable timeline. The user would create a time line of their unique workflow that would be shown at the top of the screen and manage their navigation. After regrouping, the UX team determined the main goal for the future EHR was to be highly customizable and responsive. The visible timeline idea was adjusted to utilizing widgets and multiple ‘pages’ accessed by the innate swipes and scrolls of mobile navigation. The user could then create their timeline through either scrolling on one page with many widgets, or creating multiple pages with single widgets they could access via swiping. Past and current EHRs are more or less a one size fits all experience. (There are likely hundreds of preferences and parameters but they aren’t truly customizable at the end of the day) There was uncertainty about what healthcare providers would think of this since the burden of setting up their workflow would be entirely on them. Two usability testing tracks (two moderators, two note takers) were devoted to this problem at the Engage 2014 user conference. I was one of the moderators and created the paper prototypes. First, I created several ‘blank’ facesheets. (The main page for a medical chart, they often have a photo of the patient thus the term ‘facesheet’) These were then glued to foamcore for stability and durability during use and air travel. Users could create multiple ‘pages’ to imitate what they would expect to see when they swiped to the right or left by adding the blank face sheets to the left and right. 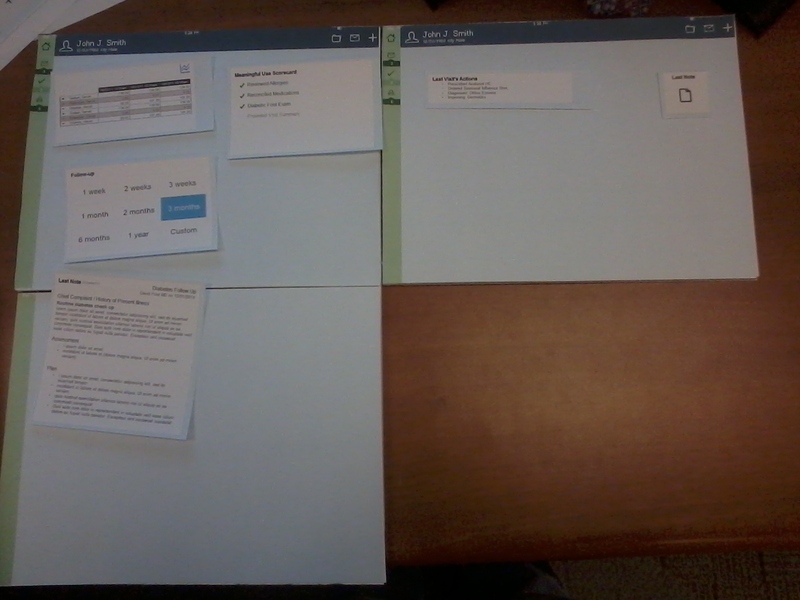 Users could add pages to the bottom by adding a new foamcore board at the bottom to show what would happen when they scrolled. I created as many widgets I could think of based around each software’s components. (Ex:Prescription writer, Problem list, Allergy list.) I also created several sizes and styles of blank widgets for the users to write out what they wanted. The users first watched a brief introduction video that showed how they could theoretically customize their facesheets to their workflows. Then, the moderators helped to guide them through creating their ideal experience without the limitations of their current software. At first, some of the users were a little uncomfortable with the exercise. Asking them to break their workflow free of the software they were accustomed to was challenging. For other users, they were immediately delighted they could show us exactly what they wanted, where they wanted it. Several asked when the software would be available. Most users created several pages, helping lend credence to our idea of a workflow timeline. A few users created a single page, or kept their workflows identical to what their current software allowed. Many wrote on the paper widgets, crossing out information or adding as need Many created their own which helped drive home the idea of customizable widgets to stakeholders.. The findings from this prototype testing are actively being worked into the code for a mobile EHR and several initial iterations have been released in the iOS, Android, and Windows application stores.